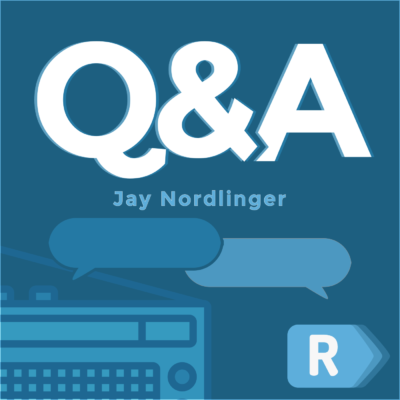 Jay Nordlinger is a senior editor of National Review and the music critic of The New Criterion. His guests are from the worlds of politics and culture, talking about the most important issues of the day, and some pleasant trivialities as well. In this second episode of his new “Jaywalking” podcast, Jay Nordlinger plays some music from Massenet’s “Thaïs,” including the Meditation, which is how the episode gets its name. Jay also talks about Fritz Kreisler and Fritz Crisler (a legendary violinist and a legendary football coach, respectively). Then he’s got Nazis, slavery, North Korea, and other cheerful stuff. He ends with genuine cheer, however: the American Dream and more music. Jay began his Impromptus column in 2001. It is a potpourri of a column, covering politics, foreign affairs, language, music, and a lot more. Now he is starting a podcast version of it, called “Jaywalking.” This podcast will feature extra touches as well – such as the playing of music. In fact, he begins this inaugural episode with some impromptus – some piano pieces by Schubert, Fauré, and Chopin. He goes on with talk about Roy Moore, Sweden, and an Israeli judo star. He tells an old joke, on the bawdy side. And he ends with what he calls “pretty much the best thing on earth” – a song, a spiritual, in a transcendent performance from 1975. This week, Daniel Hannan, the one and only, dropped by National Review headquarters in New York. Taking advantage, Jay sat down with him for a “Q&A.” Hannan, as you know, is the British writer-politician extraordinaire. With Jay, he discusses the nature of America. And then the question of national self-determination: What right do the Catalonians and Kurds have? Everyone can’t have his own country, can he? The Chinese Communist Party has just conferred on its leader, Xi Jinping, the status of Mao Zedong. He is the most powerful boss in China since Mao. His status is virtually god-like. Having Xi’s number, and the CCP’s number, is Stein Ringen, a professor emeritus at Oxford University. Ringen is the author of The Perfect Dictatorship: China in the 21st Century. For the Washington Post recently, he wrote an article summing up China today, here. A year or two ago, a colleague of Jay’s said, “If you want to know anything about Russia and Europe – if you want to know anything about Putin’s influence worldwide – you MUST consult Mark Galeotti.” He never forgot it. And Jay has now done a “Q&A” with Galeotti. He is a British scholar working in Prague. He does indeed know everything, or an enormous amount. With Jay, he talks about Putin, Russia, Europe, the U.S., nationalism, jihadist Islam, Facebook, Twitter – many of the things that are in our faces now. Catalina Serrano is a Colombian and the wife of Andrés Felipe Arias, a minister in the cabinet of President Álvaro Uribe. Arias was, in fact, Uribe’s chosen successor. But Arias was railroaded in the Colombian judicial system. His case is positively Kafkaesque. With his family, he fled to the United States to seek political asylum. He is now in federal detention, scheduled to be extradited. Listeners to this podcast may need a cheat sheet, as Gheorghiu refers or alludes to things without making them explicit. He has a new novel out, Mark Helprin does: “Paris in the Present Tense.” Among his previous novels are “Winter’s Tale,” “A Soldier of the Great War,” and “In Sunlight and in Shadow.” The new one is about love and loyalty. Aren’t they all? As Jay says, it’s another blow by Helprin for truth and beauty. Enjoy the show. Jay pronounces Golda Schultz one of the world’s best interviewees – and that is an easy call to make. She is a young South African soprano, currently working at the Metropolitan Opera. Jay interviews her there. They talk about New York, South Africa, opera, Broadway, and life. Do you know Golda? You’ll want to. On a recent National Review cruise, Jay sat down with an old friend and colleague, Kathryn Jean Lopez, a.k.a. K-Lo. They talk about some things dear to Kathryn’s heart — and to Jay’s — chiefly the pro-life cause and the cause of adoption. Stop spending a fortune on gimmicky shave tech you don’t need. Make the SMARTER CHOICE by joining Dollar Shave Club. Get your first month for only 5 bucks, with free shipping, by going to DollarShaveClub.com/QA. Leyla Hussein was born in Somalia and has long lived in Britain. Age seven, she underwent female genital mutilation – which she describes as sexual assault. She is a prominent, fearless, and also, frankly, delightful campaigner against this. With Jay, she talks about different angles of FGM. You know what class of people she has taken the most flak from? White liberal women. Treat yourself to this “Q&A,” and to the extraordinary Leyla Hussein. Ben Shapiro, the conservative writer and journalist, spoke at Berkeley last week. They spent $600,000 on security. For lil’ ol’ Ben? Yes. He spoke bravely and well. In this “Q&A,” he talks about the experience with Jay, and about higher education, the political temperature in America, health care, and some other things. This episode is a quick blast o’ Ben. Douglas Murray is a British intellectual, famous since he was a teenager. His latest book is “The Strange Death of Europe.” It is No. 1 on the U.K. bestseller list. In this “Q&A,” Jay asks him about politics and policy, of course. Politics and policy in Britain, America, and elsewhere. But they also talk about novels, poetry, and music. (Murray himself is a musician.) When you have time, spend an hour with one of the most interesting writers in the world, Douglas Murray. George F. Will, for many people, has long been a conservative’s conservative. The very model of a conservative. Today, however, many people don’t think of him as a conservative at all. Sean Hannity, Steve Bannon, or Donald Trump, yes. George Will, no. Jay takes up this strange question with his guest. In addition to “conservative,” Jay asks Will about some other words and phrases, including “America First” and “deep state.” They further talk about the Confederacy and its monuments. And North Korea. And Afghanistan. And, to close, baseball. As Jay says at the outset, Kevin D. Williamson is one of his favorite writers and favorite people. In this hour, they explore a range of subjects either timely or timeless (and in some cases both). They talk about Kevin’s upbringing in West Texas. And about controversies he’s been involved in. (“White genocide”?) And about Trump, and economics, and immigration. They end on such topics as writers and composers. All in all, they explore the Williamsonian point of view, or the Williamsonian persuasion. Meet a man and a mind. Michael Mukasey is one of the most distinguished lawyers in the country: a former federal judge, a former attorney general. With Jay, he talks about becoming a lawyer. And studying with Bork. Then he discusses some names now in the news: Jeff Sessions, Joe Arpaio, James Comey, Robert Mueller, Donald Trump … An interesting and stimulating Q&A about our law, our politics, and our fate. As Jay says, Robert Costa is one of the leading political reporters and analysts in the country. He works for the Washington Post and appears on NBC and MSNBC. He is also host of “Washington Week,” the venerable public-affairs program on PBS. Jay asks him about the Trump White House: Is it still fun to cover? Still juicy, even with the arrival of the disciplined General Kelly? What about McMaster? What about (the departed) Bannon? What about Sarah Sanders? The world is quaking with problems; America has a few of its own. Jay talks about some of them with Elliott Abrams, late of the Reagan State Department and the Bush (43) White House, now with the Council on Foreign Relations. The Afghan War: Should we be continuing it? What does victory look like? North Korea: Is Steve Bannon right? Do they “got us”? Russia: Was Congress right to sanction them as they did? Is this a usurpation of executive authority? What about Ukraine: Arm them? Sir Roger Scruton is the British philosopher, novelist, composer, etc. Jay likes to talk to him about pressing issues of the day and timeless ones as well. Sometimes, they are in the same group. On this podcast, Jay talks with Sir Roger about the “post-truth age.” And Donald Trump. And the nature of conservatism. And patriotism versus nationalism. And Russia. And democracy. Do you want more? There is the question of social welfare and whether capitalism can deliver the goods. There is the question of Amazon, the online retailer: Is Trump right in his attacks on it? There is also the question of the smartphone, and all related to it: Are we losing the ability to be fully or properly human? Are the social media robbing us of our manhood, somehow? Yefim “Fima” Bronfman is one of the greatest pianists of our time. He has been playing at the Salzburg Festival, where Jay has been working. The two of them sat down for a “Q&A,” covering a range of topics: composers, pianists, and the musical life. A fine opportunity to hear words from someone famous for notes. P.S. The podcast goes out with Bronfman in Prokofiev’s famous, fearsome “Precipitato,” from his Sonata No. 7.